What’s the deal with weight? Should you ditch the scales? Short answer – No. Long answer…it’s how you use them. Bear in mind that your weight fluctuates based on many factors. Time of day, hydration levels, time of the month, the size of your last few meals. If you weigh yourself once a week at the same time each week and monitor your progress over time, you’ll know what your status is. There’ll be peaks and troughs but look at the general direction of the curve. Don’t be that person who weighs themselves twice a day and gets depressed because the number on the scales went up. Is it possible to look better but weigh more? Yes, but it takes way longer than you think. If you’ve got a year or two before your deadline/holiday/wedding etc. and you don’t have a great deal of body fat to start with, yes, you may look better if you’re heavier – assuming you gain muscle only. Take me for example, in October I’ll be heavier than I was last October and I’ll look better (hopefully) because I’ll have gained more muscle mass (unless you’re into skinny guys). However, if we compare my physique now (July 2018) to my body in 3 months time, I’ll only look better if I lose weight. Three months is not enough time for me to gain weight and become leaner. Not without some help from illegal substances. It’s only really possible to improve your physique by getting heavier if you’re anorexic or if you’re starting from what we call “skinny-fat” i.e. you’re low in muscle mass, flabby but still quite thin and you’ve got enough time to build sufficient muscle mass to fill the space where you currently have fat. In almost all cases though, you’ll look and feel better if you shed some weight. You’ll also be more mobile as body fat inhibits your movement. I’m at my most nimble when I’m really lean. Are you big boned? No. Nobody is big boned. That’s not really a thing. Yes, some people have may have slightly higher bone density than others, but check this out: my bones weigh 3.8kg according to the body composition machine, and if you think logically, I must have dense bones because I lift weights all the time (weight lifting increases bone density). So a “heavy boned” person is likely to only have a few kg of weight attributed to that. It won’t impact your overall weight significantly. Is she naturally skinny? No. She’s either skinny because she’s tall and tall people require more calories to stay alive, or she only eats loads when she’s in front of you. This is often the case. You can’t get an accurate picture of how much someone eats when you have dinner with them because many overweight people tend to be hold back and go for the salad option (because they care about what people think) and skinny people tend to go all out (because they don’t ordinarily eat that much and they’ll make up for it by eating less the next day). I’m generalising of course, and this may not always be the case, but there’s no such thing as a “natural weight”. We’re all designed to gain weight when we eat more than we use, and lose weight when we don’t eat as much as we use. If your body doesn’t work like that, it’s broken. Your weight is affected by your hydration levels. This is true. Coincidentally 1 litre of water weighs 1kg (not a coincidence, that’s how the metric system works) so drink a litre of water and you’ll weigh 1kg more. Muscle weighs more than fat. This is true, so technically you can start training and lose fat/gain muscle without your weight changing. But as I said in point 2, muscle gain takes ages so it’s unlikely that’ll you have lost much fat at all if the scales say the same after a few weeks of your regime. 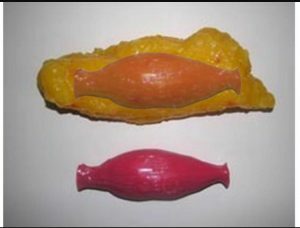 Also, that image which is doing the rounds on the internet of 5lbs of fat vs 5lbs of muscle is not real. The relevant densities are: muscle 1.1kg/litre and fat 0.9 kg/litre, so the difference is marginal, and the fat will be around 20% more in volume. So to show what that means I’ve taken the image that’s doing the rounds and layered an image of a “20% bigger” muscle over the fat so you can see what that actually looks like. In reality, the fat in that image would weigh closer to 20lbs, not 5lbs. Should you be embarrassed if people know your weight? No. If you’re weight is a problem, people can see it. They don’t need to know your actual weight to judge you. Should you be embarrassed about trying to lose weight? No. If you’re trying to improve your health, you’ll only get respect. Letting people know about it will help keep you accountable. And although your Gran might tell you that you’re too thin already, she’s coming from a place and time when people didn’t know about heart disease, didn’t have access to loads of food and she probably still thinks that age makes you gain weight, whereas we now know it’s not your age, it’s your lifestyle. It’s easy to blame age though because it’s out of your control. But if there’s one message I want you to take away from this it’s that your body weight is definitely within your control.